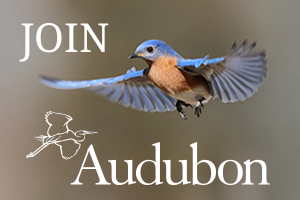 On September 1, the first day of this year’s hawkwatch, 48 people turned up, as well as one Bald Eagle, four Sharp-shinned Hawks, three Cooper’s Hawks, two Broad-winged Hawks and one American Kestrel. This was a respectable, if not noteworthy, assortment and number of migrating raptors. But the best way to describe this first week of September was “hot and humid” – poor conditions overall for migrating raptors. In spite of the fact that a total of 17 Bald Eagles had been sighted up to September 15, the overall migration continued to be slow. However, by the end of the day on the 15th, 1240 Broad-winged Hawks, and a total of 1306 raptors were tallied, so things were beginning to improve. And, on the 16th, there were big kettles of Broad-wings, for a total of 1638 that day, as well as seven Bald Eagles. 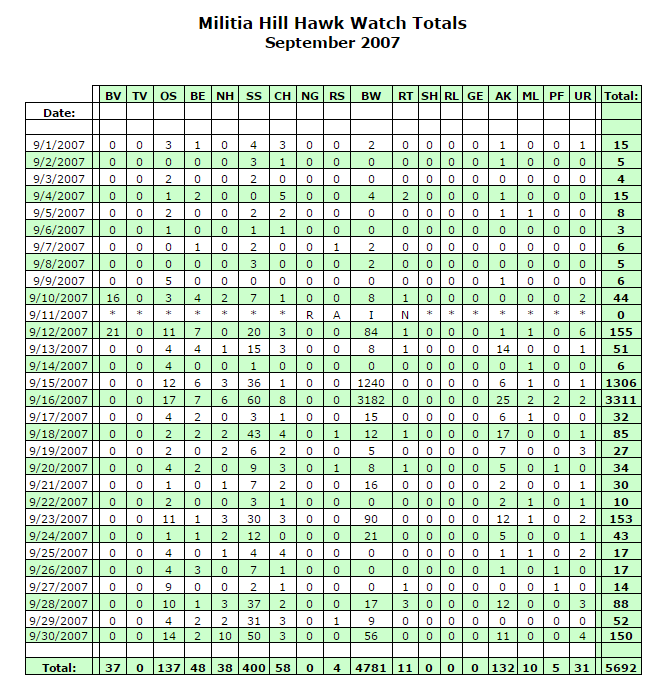 Although the Broad-wing count was considered low for mid-September, Militia Hill tallied more Broad-wings than other nearby hawk watches. 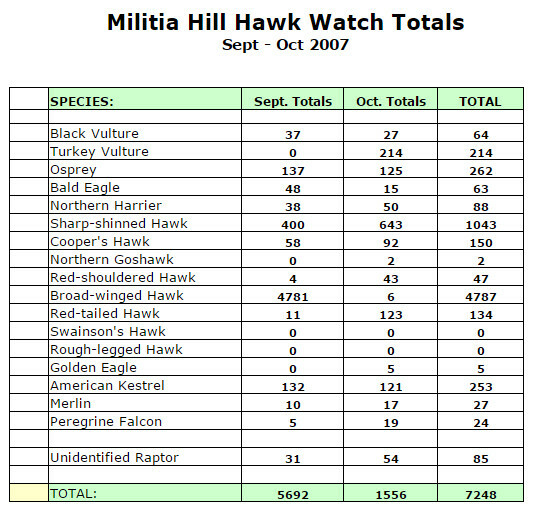 By September 18th, two more Bald Eagles and several Sharp-shins put Militia Hill over 5000 raptors for the year. On September 19th, an Osprey carrying a fish was photographed. On September 23rd a slight cold front passed through and brought 50 assorted raptors including one Bald Eagle. 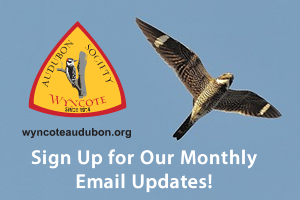 A Peregrine Falcon was sighted on September 26th, as well as three Bald Eagles. On that day, a trash tree was removed from the skyline, and visibility from the deck improved. And the Bald Eagle count continued to rise. The beginning of October brought more unseasonably warm weather. 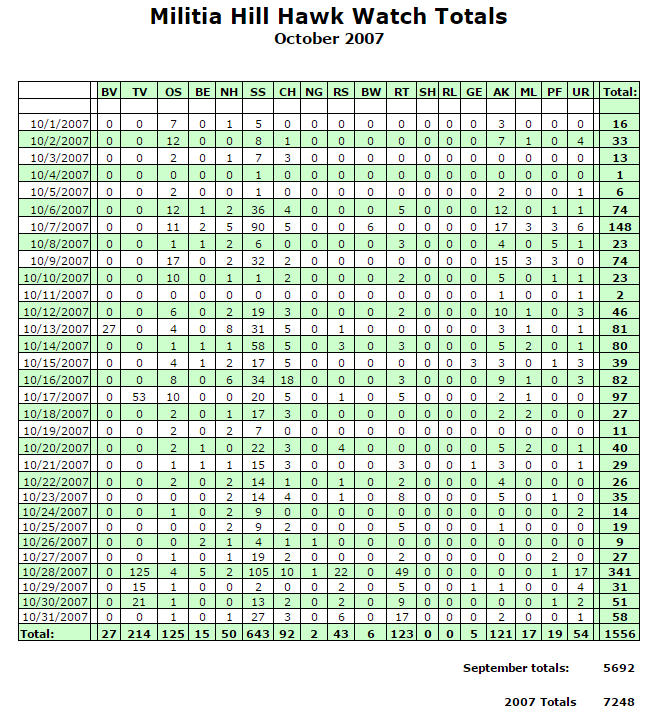 However, in spite of this, on October 6th, 74 raptors were tallied. On the 7th, the first Snow Goose was sighted, in the midst of a skein of Canada Geese. 148 raptors were counted that day. Rain off and on hampered raptor watching from time to time, and September 11th was entirely rained out. Following the front, more skeins of geese were seen. On Monday, September 15th, three Golden Eagles were sighted within an hour. A Bald Eagle followed, and offered a nice comparison with the goldens. On Sunday, October 21st, observers got a great look at a “naked eye” Golden Eagle which flew right over the deck. Just ahead of a cold front on October 26th, two Bald Eagles and the first Northern Goshawk were sighted. There was heavy rain on the morning of October 27th, but in the afternoon 700 Snow Geese were counted, along with a second Northern Goshawk. On October 28th, 125 Turkey Vultures, a record for Militia Hill, kettled overhead. That same day, five Bald Eagles, 341 total raptors, nine Common Loons, over 3000 Canada Geese and 26 Wood Ducks were counted. Sightings on that day brought the year’s total to over 7,000 raptors. October 29th brought the fifth Golden Eagle. Bald Eagles continued to be the stars of the show at Militia Hill, with a total of 63 for the year. Other notes from the deck included Screech and Great-horned Owls heard at dusk early in September, the first White-throated Sparrow of the season heard on October 4th, a Red-breasted Nuthatch at the feeder on October 9th, the first Dark-eyed Junco on October 12th, and the first White-crowned Sparrow on October 15th. On October 20th a mink made a surprise visit, foraging under the feeders. On Sunday, October 14th, master falconer Tom Stanton made a guest appearance, and brought along a 6-month-old male Northern Goshawk and a two-year-old female Peregrine Falcon. Over 75 people watched and listened enthusiastically as he and Marylea moved through the group with the birds. According to tradition, the picnic on Halloween marked the conclusion of the Militia Hawkwatch season. Over 75 people came to the pavilion for a wonderful spread of goodies. Marylea Klauder was honored for her 20 years as Hawkwatch Coordinator.